Halibut is such an expensive fish. Usually, steaks or fillets can run up to $15.99, $19.99, and sometimes, depending on where you shop, up to $29.99 per pound. Much as I like halibut, I can't really justify blowing the budget on one fish. One day, the Chinese supermarket had some halibut on special. Mind you, though, it wasn't choice halibut steaks or fillets. Rather, they were selling what they've labelled "halibut tails," which I assume would be whatever pieces of halibut meat left over after they've butchered the fish. They were selling the "tails" for $2.99 per pound, so I thought I'd take a couple of pounds home and see what I can make of it. It seems like, when I find myself in some sort of doubt, I revert to an adobo recipe of sorts. I view adobo, after all, more of a technique than a recipe. We've adobo-ed chicken, we've adobo-ed pork, we've adobo-ed salmon, we've adobo-ed trout -- no reason why we couldn't adobo some halibut tails. In fact, I place great trust in the technique of adobo: I figure all that acid in the vinegar is going to kill whatever needs to be killed. I did a coconut milk adobo for my halibut tails and it turned out wonderfully. The halibut tails were really meaty and substantial, and with sauce that can be put on some steaming white rice, two pounds of fish can swell and feed a family of six. Next time they have a sale of halibut tails, I'm going to grab a couple of pounds again. I'm already fantasizing how good these chunks of tail are going to be in an Indian curry or a Thai curry preparation. Use our Chicken Adobo in Coconut Milk as your starting-off point. The tail meat can be so delicious. and this looks yum. Fab! So resourceful! I don't think halibut is that expensive at the Chinese markets by me. That sounds pretty steep! Halibut is expensive, but so good. A big fan of coconut, this sounds like a great dish. Haha... Yes, we all have our go-to flavors. Oh, there's actually never any halibut fillets on sale at the Chinese supermarket. NEVER! So those (outrageous?) prices are found elsewhere. They only have halibut steaks at times. I can't seem to resist its meaty firm texture. Ah yes! 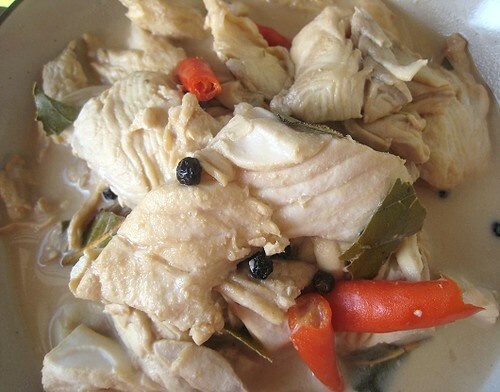 Actually, we've had "halibut green curry" at a Thai place... and they probably used the same part, since they were also in little pieces like this.